Colorado River Bridge, which is taking shape less than a kilometre downstream the Hoover Dam, is following in the footsteps of the engineering marvel. The Hoover Dam — the massive canyon formed by the Colorado River where it joins Nevada and Arizona — already boasts one iconic piece of engineering. The Colorado River Bridge is the central portion of the Hoover Dam Bypass Project. Construction on the nearly 2,000-ft-long bridge began in January 2005. On completion, the bridge will span the Black Canyon (about 1,500 ft south of the Hoover Dam), connecting the Arizona and Nevada approach highways nearly 900 ft above the Colorado River. The JV contractor building the river bridge, Obayashi Corporation and PSM Construction USA Inc, recently completed the connection of the 1,060-ft, twin-rib concrete arch. The design, fabrication and erection of the new highline system were completed in January 2008; while the construction of the steel tub girders and deck on the approach spans and casting of first segments at the end of each arch were completed in 2009. The final sections of the arch were connected and the supporting cable system was removed in August 2009. The overall structure comprises a 1,090-ft main arch span, a 690-ft Nevada approach, and a 235-ft Arizona approach. The superstructure consists of steel box girders spanning about 120 ft on the main span and up to 180 ft on the approach spans, with a composite concrete deck. The concrete solid rib is a classical twin rib concrete arch, with cast-in-place spandrel columns, and a cast-in-place concrete box girder deck. The arch tapers from 18 ft deep at the skewbacks to 12 ft deep at the crown, and is cast in place with stay support and form travellers. The concrete composite alternative combines a twin rib concrete arch with steel spandrels and a conventional steel box girder with composite concrete deck. The Vierendeel-rib alternative provides maximum opportunity for aesthetic expression. The concrete arch for the longer span is a twin-rib box girder, tapered in elevation, and splayed in plan. The arch crown is integral with the deck, which lessens second order effects and blends well with the aspect ratio for the long-span alternative. The long-span trussed rib alternative is a traditional engineering solution to a long-span steel arch crossing. The structure consists of a 1,325-ft main span arch with 455-ft and 235-ft approaches on the Nevada and Arizona sides of the river respectively, for a total structure length of 2,015 ft. 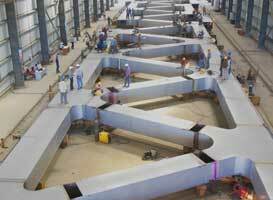 The superstructure comprises steel plate girders spanning about 130 ft with a composite concrete deck. The approach spans similarly comprise vertical column bents supporting a steel plate girder superstructure with spans to 160 ft. The vertical and diagonal web members of the trusses will be structural tubing. All bent and rib bracing members will also be fabricated from structural tubing. The JV used two 58-m Putzmeister pump trucks to place 2,030 cubic yards of concrete, supplied by Casino Ready Mix, for the Pier 5 Skewback footing. Quinn Concrete Pumping Inc (Quinn) of Las Vegas also lent its services to the Colorado River Bridge project. Quinn supplied both pump operators and provided its own Putzmeister equipment. Most notably, Quinn’s 42X- and 58-m truck-mounted concrete boom pumps were used on site to pump and place concrete for the bridge’s pier. Upcoming work on the project includes setting the precast columns, erecting the steel girders, casting the roadway deck and barrier, asphalt paving and guardrail on about 75 per cent of the approach project length. The final project will include the short sections of the remaining roadway tie-ins to the River Bridge and US 93, as well as signing, striping, barrier, and pedestrian facilities on the entire bypass. The Federal Highway Administration (FHWA) has awarded a $ 7 million contract to Frehner Construction Company Inc of North Las Vegas, Nevada, to complete the final roadway elements that will allow traffic onto the Hoover Dam Bypass. Additional work will include paving and parking area improvements for the visitor and pedestrian plaza. With construction on for the past five years, this $ 240 million project is expected to be complete soon. The new bridge, just half a km downriver from the dam, will only add to the splendour of the area and give North America its first composite concrete deck arch bridge. Contractors: Obayashi Corporation; www.obayashi.co.jp; PSM Construction USA Inc; Tel: (650) 344 -9109. Fax: (650) 344-9199. Project management: Central Federal Lands Highway Division; Tel: (720) 963-3500.